Manus shall celebrate the end of the century throughout the year . To meaningfully celebrate, we must do the best we can to make our way of life better in 1999. We should do so in our families, our churches, our businesses, our villages, our town and in our Province. For some of us we must complete the church building or classroom or the house we started some years ago. For others of us we must reconcile or settle the differences we have with those we have not talked to for many years. For all of us, we must do what we should have done but have repeatedly failed to do. In its weekly broadcast programme during 1999, Radio Manus will use a ten minute time slot every Wednesday evening to speak to the people of Manus about themselves. The programme aims to create awareness and generate opportunities for the people to talk about themselves and the challenges that face them as they move into the year 2000! There will be 52 Radio Talks for the year and these will be broadcast under a new programme call MANUS INTO 2000! 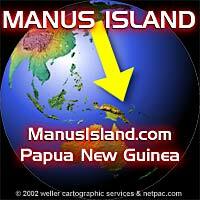 Manus has a population of about 36 000 people. She has a total land area of about 2, 100 square kilometers. As a province, she is the smallest of the 20 Provinces in Papua New Guinea. Although the total population of 36000 is small by comparison with other places the people of Manus speak 30 different languages. As people from other Provinces come to Manus with their own mother tongue they add to this multiplicity of languages. Tok Pisin, Motu and English increase the total number even more. Our villages are very small. We rely on each other for life and survival. The sea divides us, provides food for us, joins us with others and challenges us. When the Europeans came., they found that Manus had people living on its many islands. Every where they went the Europeans found thriving communities. Some were friendly, others were not friendly. The Europeans may have wanted to own the land in the first place but subsequent history tells a different story. Manus is now part of the young nation of Papua New Guinea. Manus therefore remains ours today. We live in our villages. We own our land, our bushes, our reefs and our sea. Our lives centre on our land and sea. We are different from one another but we are one as a result of the changes that have taken place during the 1900s. These changes were brought about mainly by the Christian missions, the businesses and the government. Have you ever stopped to seriously think about the following questions? Where did we come from? How did we get here? When did we get here? How long have we lived in Manus? What have we done for ourselves? What are we going to do? These are some of the questions that will be explored in the Manus Into 2000 Radio Programme during 1999. As we ask these questions and try to find answers to them, we hope to raise interests in us to see that we are a people whose roots go back many many thousands of years; that we are not merely a product of European colonialism; and that we have lived on these beautiful islands long before the Europeans came. We must therefore take responsible pride in ourselves as we strive to improve our quality of life in a rapidly changing environment. As we turn the corner of 1900s into year 2000, we must prepare ourselves physically, mentally and spiritually. However, this programme on its own will not prepare us physically, mentally and spiritually as we move across time. But together with what we know; what we have done and what we will do during 1999; the programme should create excitement in each one of us, to prepare ourselves individually and as a community to move on. The programme is designed in four parts. Part One will be on Manus Identity. What makes us what we are? The Manus Flag and the symbols which make up the flag will be the focus of this segment of the programme. This segment will begin next week with the young man whose entry was chosen in the flag competition 22 years ago and from which the Manus Flag was designed. Luke Noni Bulei was a grade 6 student at Worei Community School when he entered the flag competition in 1977. He is now an aircraft mechanic with Air Niugini in Port Moresby. He is married and has a family. He will tell us what went through his mind when he put the ideas down on paper 22 years ago. And for 10 weeks following Luke Noni Bulei's talk, we will hear what the Manus people think about themselves as they speak about what the Manus Flag means to them. Part Two of the programme will begin in the first week of April and end in June. This sector will focus on the Manus Past: Through the Eyes of the Scientists. Using the tools of archaeology, prehistory and linguistics, we will visit our unwritten past. What do the remains that were left behind by the first settlers on Manus say about us? What do our languages say about us? Part Three will start in July and end in September. This time we will visit our past through our own eyes - Manus Past: The Legends. A series of 12 legends of historical and cultural significance will be selected from the 12 Local Level Government Areas for the programme. Part Four will start in October and end in December. In this programme we will look at Manus to Year 2000 and Beyond. The political, economic and social changes that have taken place will be visited. We will also look ahead into year 2000 and beyond. During the year, it is hoped that this programme will create interests in our people to talk about what makes us what we are. And as we listen, think and talk we prepare ourselves to move over into the year 2000.